2005: Pittsburgh: After work, I managed to catch a northbound loaded coal train on the Conemaugh subdivision near Harmar, Pennsylvania with NS 9363, 9404, and 1702. My blog entry. 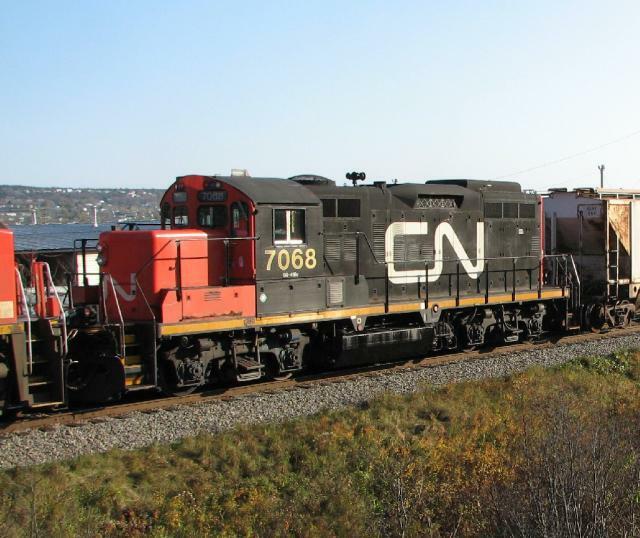 2001: Saint John: CN 5270 and 5798 would be the power for CN 305 out of Saint John that day. CN 7068 was shunting the Island Yard. Helm leaser HATX 175 and SW1200 NBSR 3702 were shunting the NBSR Dever Road yard, shortly before the eastbound train arrived around 15:30. The eastbound had Helm leasers HLCX 3668 and HLCX 3669 and GP9 3701. 3701 had quite a bit of oil on its side. Right after they arrived, SW1200 3703 started taking cars off the tail end of the train. 2000: Saint John: I saw NB Southern 9801 at the west end of the NBSR Dever Road yard. 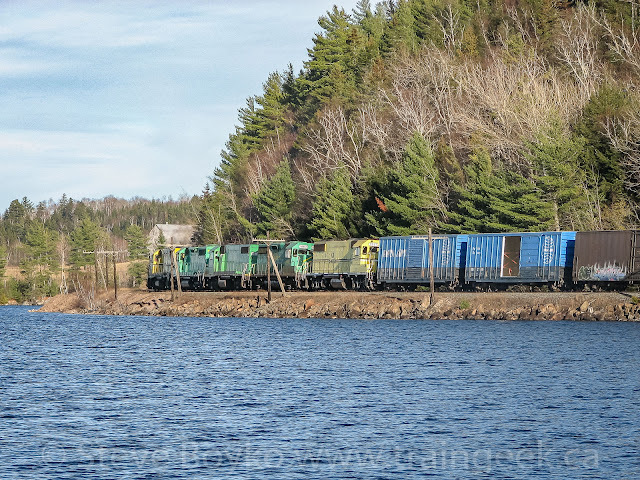 Later in the day, as I passed through Fredericton Junction I saw the eastbound freight around supper time, with NBSR 9803 leading chop-nose GP9 3787 and high hood GP9s 3701 and 3700. "Well, no offense, bc perhaps you are infatuated by trains & not that there is anything wrong with that, but I honestly do NOT hold that facsination! Not that death & destruction are cool in any realistic sense, but it still would have been kewl as hell to see the train derail. So, no thank you for wasting 59 seconds of my life. I have sad news. Don McIver, formerly of Don's H.O. Service, has passed away. R.I.P. Don. My best to his family and friends. I decided to take advantage of one of the last nice days of this year, and take some shots at McAdam. Peter Gough accompanied me and my two youngest kids. 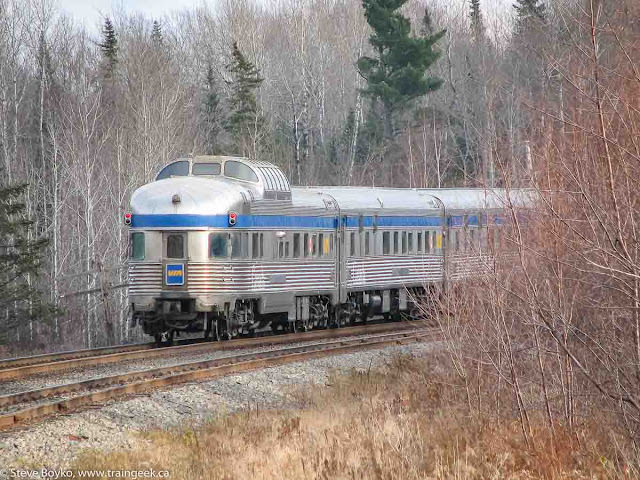 We left Fredericton at about 11:45 and I was hoping to catch the NB Southern eastbound before it arrived at McAdam. I called my contact and he told me they had a small pickup at Mattawamkeag, so they wouldn't be into McAdam until about 13:45. Perfect. We did a quick check at the McAdam yard, and found a big surprise - MEC 320. This unit was returning to Woodland, ME via the St. Stephen sub. Apparently about once a month Guilford exchanges the unit there for another one. We also saw these odd loads. These are going to Vanceboro and are likely part of the International Power Line being built between New Brunswick and Maine by NB Power and Bangor Hydro. 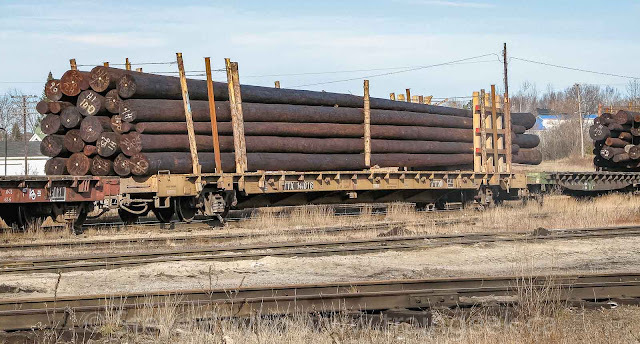 These loads are separated by spacer flatcars, as the poles are longer than the flatcars. I don't know about the Maine side, but on the New Brunswick side many of the transmission towers are going to be erected laying on their side, then flown by heavy-lift helicopter to the site. This will avoid the need to build roads and therefore reduce environmental damage. We decided to set up at St. Croix and wait for the eastbound. When we arrived there, we could hear the rumble of engines but it was not getting closer. We set up and waited, and finally the NB Southern eastbound came into view at about 13:25. NB Southern 2319, 9801, 2318, 9802 and 2317 led 37 cars, mostly boxcars and autoracks. 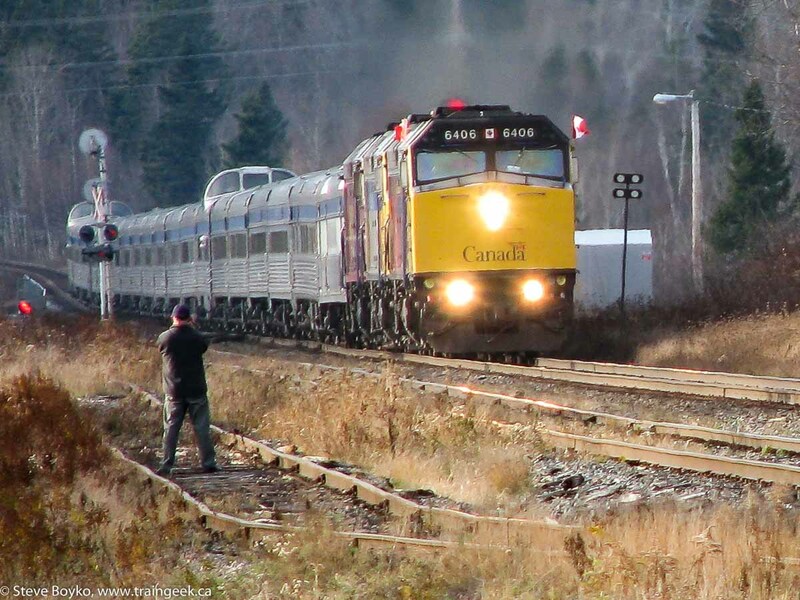 We passed the train on the way back to McAdam and I shot him coming into the station, but the light was poor. They did a quick drop and started rolling by 13:55. We drove through the back of the yard to try to get ahead of them for Harvey, when I noticed the train had stopped. It turns out they hit an ATV. The ATV had become stuck on the track adjacent to the mainline, and when the driver freed the vehicle, she drove across the main line without looking. The NBSR crew put the train into emergency and grazed the ATV, spinning it around. Fortunately, the driver was not injured and the ATV was on its way in minutes. ATVs are a major problem in McAdam. Back on the road, we decided to shoot the train at Harvey Lake. I had never tried this shot, and in fact didn't even know how to get there. Peter drove and we set up. The train rolled through at 14:40 with 27 cars. I shot video primarly, and blindly shot my still camera - shooting only water. Here's the train going around the bend, once I finally looked at what I was shooting at. Here's the video I took. Geoff Doane spotted CN train 436 arriving in Halifax this morning at 09:00 with 5 EMD export locomotives (GMRf 66723-7) behind SD40-2W 5245. There is a special Ocean train leaving from Montreal today. The train is the Ocean and Chaleur joined together in a "J train", reportedly with the entire Chaleur consist ahead of the entire Ocean consist. That means mid-train engines. The train will not having paying passengers, since this is an unscheduled train (the Ocean does not depart on Tuesdays). It is doing timings from Montreal to Matapedia to determine if it can operate like that and stay on-time. I assume VIA is trying to see if they can save one engine crew by doing this. I know a few people are going to chase it so hopefully there will be pictures soon! And now for something completely different... I have put a LEGO train video online for your viewing pleasure. This was at the Miramichi train show this past September, and I thought it was so cool that I taped it. A friend of mine, Ron Leblanc, is selling a large number of number boards from CN diesels. The boards are mostly from MLW units scrapped in the Moncton area. He is selling them for $20 each, or a little less for boards in poor condition. The complete list is at www.theboykos.com/nbcn/numberboards.shtml. He also has a few builder's plates for sale, listed on the same page. 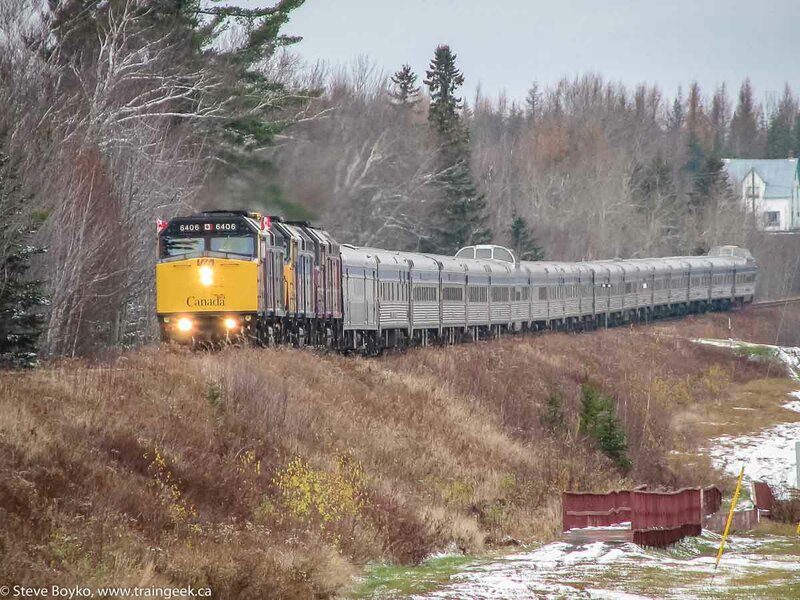 On Saturday, October 26, 2002 I spent a very enjoyable morning railfanning around Halifax, Nova Scotia with my good friend David Othen. We met at Rockingham Yard and the first train we saw was CN 120, arriving at Rockingham Yard in Halifax at 07:25. We taped it coming around the curve by the Chinese restaurant before moving to the Halifax Intermodal Terminal for its arrival at 07:41. 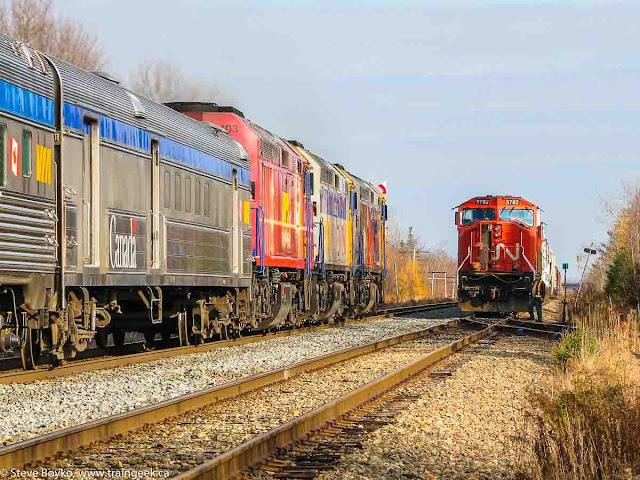 The train featured SD75I CN 5735, SD40-2 CN 5318 and Dash-8 CN 2424 leading the usual intermodal consist. The video of the train is below. Following that, we raced to Dartmouth to catch gypsum train 701 leaving Wrights Cove with an empty train to take to Milford. CN 701 had Dash-9 CN 2504 and SD75I CN 5646. We got 701 at a couple of locations on the way to the mines. Here it is at the mines with the National Gypsum switcher. While it was loading, we took a minute to catch CN 148 passing near Milford with SD75s CN 5642 and 5671 leading two CN test cars and an intermodal train. 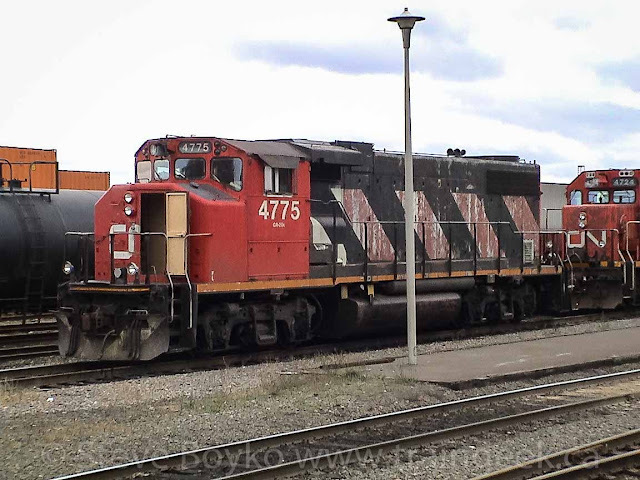 We then went to Rockingham to look at the switchers (GP38-2s 4775 and 4724). It's interesting to see the difference in the cabs for these two GP38s. Finally, we caught VIA 15 near Rockingham with 6411 and 6427 at 13:06. Apparently I don't have any photos of that online. Not a bad day of railfanning at all! I thought I'd check in again to see how well the search engines were indexing my blog. The results are varied and interesting (to me, at least). that they generally only point to the main blog page, not the archived posts. Yahoo is the farthest behind, only indexing up to my November 4 post saying I was going to chase the War Brides train. They also include a bunch of spam pages, which steal content from my web site and others in order to get included in search pages. The worst part is the spam pages get indexed faster than my own! I won't link to them because I don't want to boost their ratings, but I suggest you search for "CN GP9 units in Saint John as yard switchers". My blog post doesn't even come up but the first four entries are spam pages with the first paragraph from this blog post in them. Live.com aka Microsoft is totally up to date with the last post of November 13. They also index the individual post pages, which is great. Live.com definitely is the most up-to-date and indexes my blog the best. It's almost enough to make me want to switch to them from Google... almost. 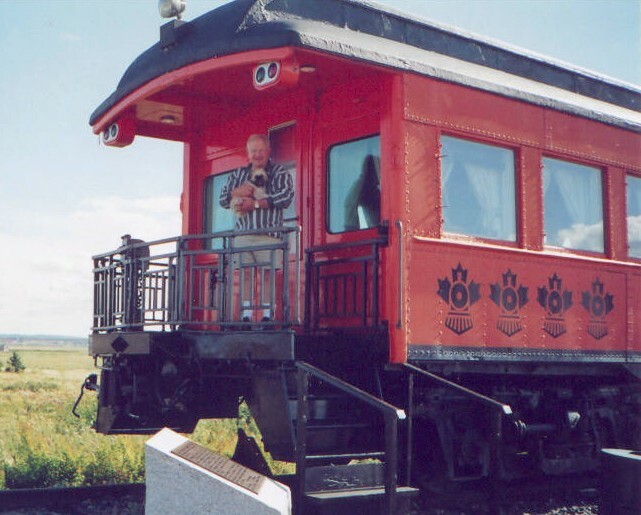 I wanted to draw your attention to the Campbellton Model Railroad Club and Heritage Railroad Museum. I haven't visited it yet but I hope to drop in the next time I'm in Campbellton. Someone asked in a comment if I had an update on the new NB Southern units. I do not. The last I heard was that they were being shipped in November, arriving in early December. I understand the other two GP38-3 units that were sold have already departed. This is my father (and dog Teika) at the Alexandra near Amherst, Nova Scotia. My dad served in the Canadian Forces from 1963 to 1987, and passed away this July 29. My thoughts go out to the members of the Canadian Forces, going in harm's way on our behalf in Afghanistan and other places around the world. God bless you and keep you safe. There have been CN GP9 units in Saint John as yard switchers since 2000, as far as I know. They replaced the SW1200RS "Sweeps" that used to grace the Island Yard. 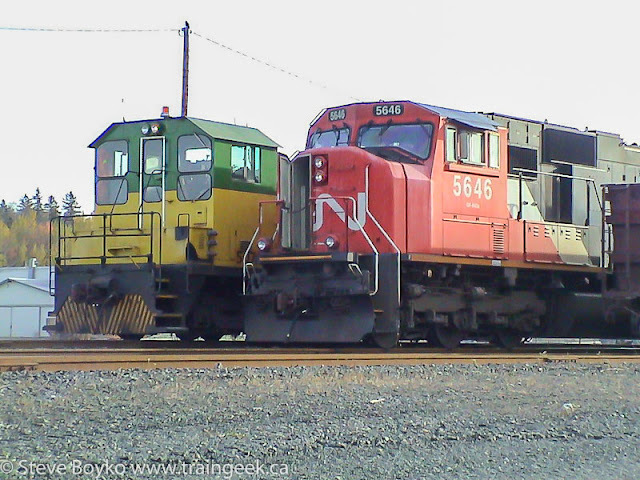 The following is a list of GP9s that I have seen in Saint John since 2000 and when I saw them. Note that date ranges are no guarantee the unit was in Saint John for th entire period, just an indication that it was spotted multiple times within that range. If you have any other sightings, please comment and I'll add them to the list! The CBC have created an interactive map of the War Brides train route with interviews, photos and video along the route. Check it out! Peter Gough and I left at a bright and early 07:15 to get Ken MacDonald and hit the road for Miramichi. After Monday's snowfall I was a little concerned about road conditions, but my fears were unwarranted. Highway 8 to Miramichi was clear and we experienced no problems on the way. As we approached Miramichi I called VIA and the nice lady told me that VIA 14 was about 20 minutes late leaving Bathurst. We decided to go to Beaver Brook north of Miramichi. We arrived and set up, and within about 15 minutes VIA roared through at 10:07. I'm glad they were flying the Canadian flags like last year's Veteran Train did. 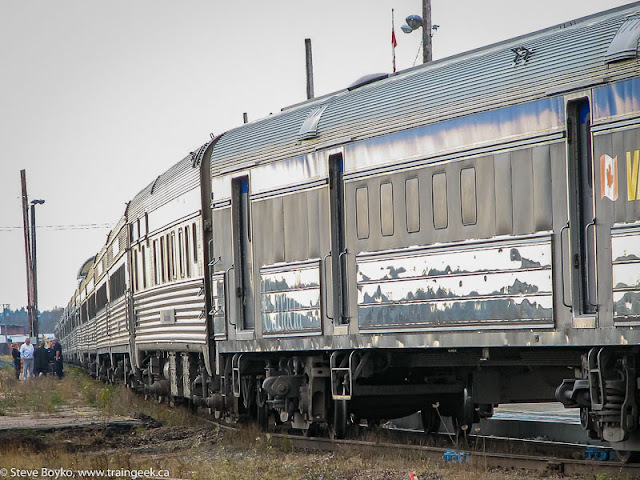 VIA 14's consist was engines 6406 (Spiderman), 6415, and 6403 (CBC) leading 20 stainless steel Budd cars: baggage 8623; deadhead sleeper Chateau Maisonneuve; coaches 8139, 8138, 8108, and 8110; Skyline 8510; diner York (8418); Chateau sleepers Cadilac (8204), Lasalle (8211), Salaberry (8226), Jolliet (8210), and Lemoyne (8215); diner Acadian (8401); Chateau sleepers Denonville (8206), Laval (8214), Richelieu (8222), Papineau (8220) and Rouville (8225); and Revelstoke Park (8711). We raced from Beaver Brook to Miramichi, and found 14 approaching the station at 10:22. There was an enthusiastic crowd waiting for the train. 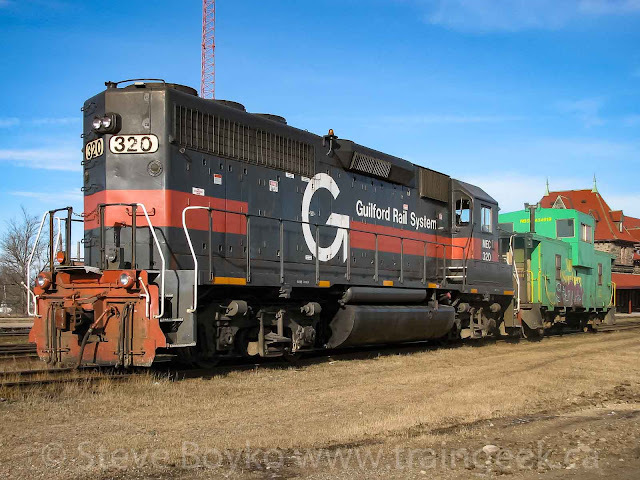 We quickly shot a few NBEC engines (SD40 CFMG 6907 and RS18s NBEC 1854 and 1867) and some odd cars in the yard, then headed for Rogersville. I called Luc Doiron to give him a heads-up and we met him and his daring uncle Bob a little west of the station. The Ocean showed up at 11:06. He did not stop at Rogersville, so we were behind the 8-ball after that. We caught up to him a few times but we never got ahead of him for more shots. I took a few shots through the window (and no, I was not driving). This one was at 11:20. Ken wanted to shoot him at the Moncton station, so we took highway 15 to the Riverview exit. There we waited our turn in the line-up to enter the circle, while 14 rolled on by at 12:04. We arrived at the station about a minute after 14 did, and took some time to shoot the train from a few angles. Painsec Junction outside Moncton was our next selection. We drove down to the junction, only to find CN 307 rolling through the siding. We realized it would block the light for the Ocean, so we went back to the road crossing at the west end of the siding. There was a CN foreman there waiting for VIA to go through. 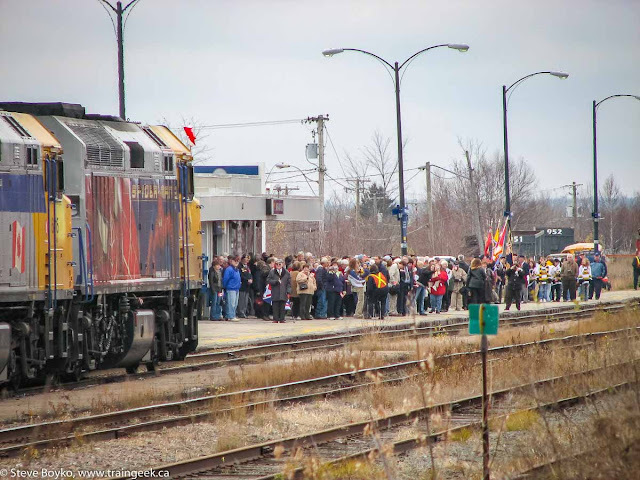 Railfans Tim Dryden and Luc Doiron showed up after a little while. I set up farther down the siding from the rest of the crew to get the "meet" shot between 307 and 14. We had quite a wait for 14 - it finally came at 13:07. The crew of 307 was out for the roll-by inspection. 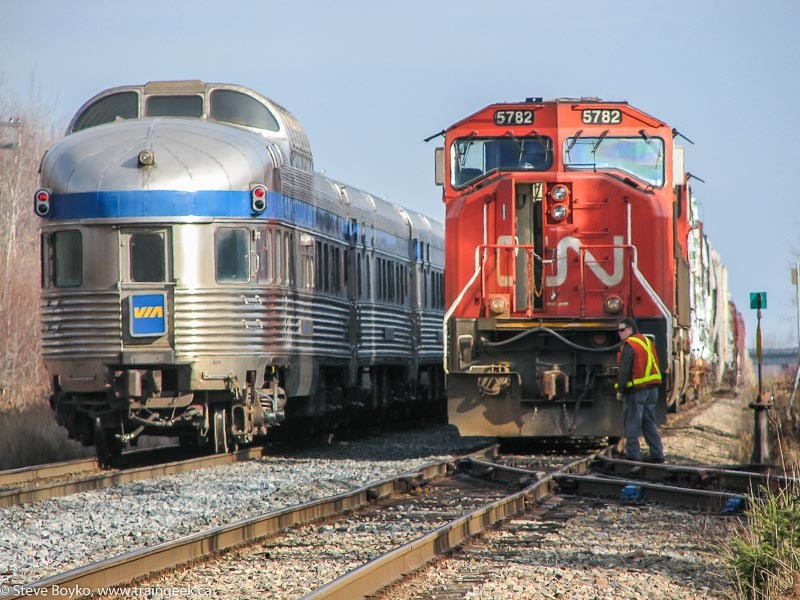 The CN foreman told us that CN 534 would be following VIA 14, to drop some cars at the Junction and then go to Amherst. As we travelled east we kept hearing CN foremen calling the RTC to get TOPs after VIA went by. The next stop was Aulac. We wanted to shoot from inside the arc, so we exited at Fort Beausejour and made our way to the berm. We had quite a wait there for 14 to come. 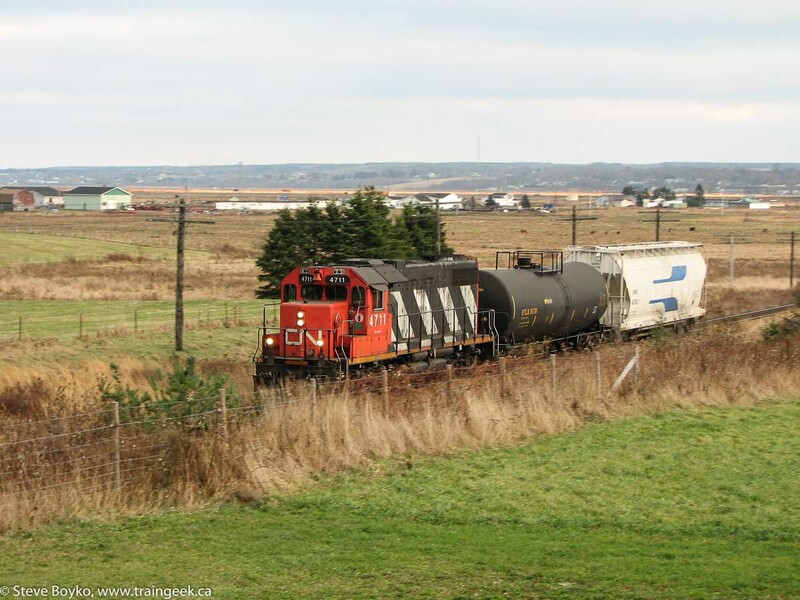 We heard it blow its horn as it approached Sackville, shortly before another crew of railfans showed up. Steve Dickie, David Morris and Fred Angus joined us on the berm. Even a few of the locals came over to have a look at the War Brides train. I don't have any stills of Aulac because I was shooting video, but the Ocean came through at about 13:50. It was running about an hour late by this time. I had a call from another Atlantic Rails member at Folly Lake wondering where the train was. Glad to help! We decided to try to get VIA 14 at the highway overpass just east of Amherst. Again, no stills but it was a good shoot. For our ninth and final shot, we went to Oxford Junction. Another Atlantic Rails member, Dara Legere, was there when we arrived. I set up well down in the siding to get the train going around the curve, while the rest of the Gang set up nearer the CN depot. We heard the train well before it arrived at 14:39. We took the time for one group shot before we left the Junction. Left-to-right: Peter Gough, Ken MacDonald, Dara Legere, Steve Boyko. Here's a video showing the train outside Amherst and through Oxford Junction. As we approached Amherst, we heard CN 534 on the scanner getting ready to head back to Moncton. A bonus train! We took the Fort Beausejour exit and waited for it to arrive. 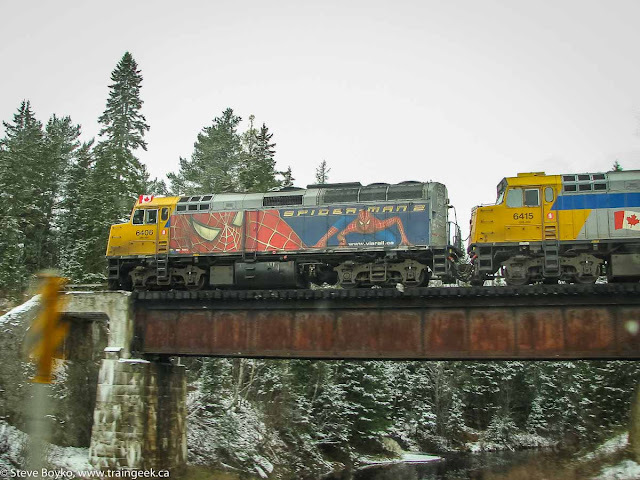 Here it is at 15:43 with CN 4711 leading two cars. What a great day - good companions and lots of train shots! The kids and I set out for a little railfanning this morning around 9:00. We went by HIT and Rockingham Yard, and I was surprised to see both empty. I talked with David Othen, and after checking the signals at Millview (dark), we concluded that both 148 and 120 had not arrived. After a short break to feed the kids, I spoke with David and we headed to the Halifax Ocean Terminals (HOT) to wait for 148. We watched GP38 units 4728 and 4722 push some container flats into HOT at 11:00. 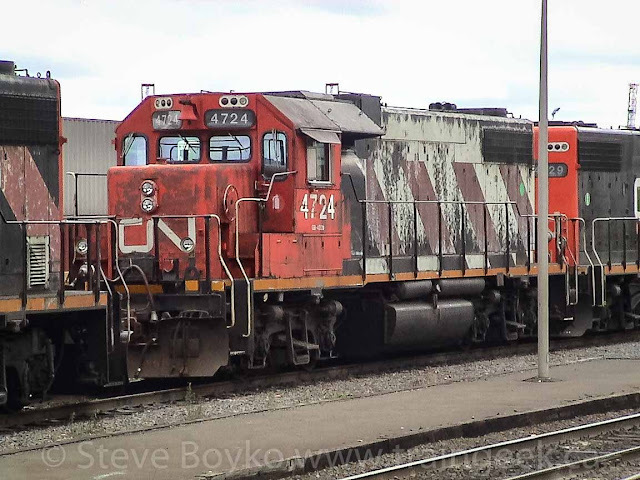 At 11:25 CN 148 came into view, led by CN 5729 (SD75I). It had to stop to change the switch and I got this shot. I took video of 148 rolling by the switcher. We went to a park for a while, then came back to see VIA 15 leave on time at 12:38, with the same consist I saw yesterday on 14. Finally, we went to HIT and saw CN 120 pushing its consist at 13:04. I shot VIA 14 at Amherst today at 13:07. VIA 6415 led Loto-Quebec 6414 and a Renaissance consist with no Park car. A lot of railfans don't like the Loto-Quebec look. I don't know - I could take it or leave it. At least it's something different. 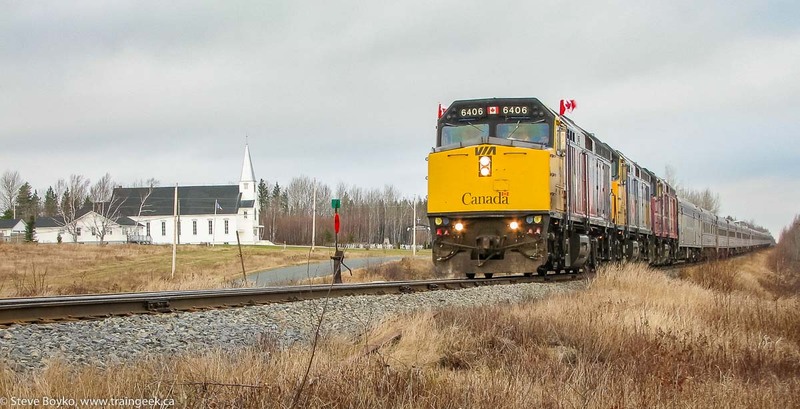 Later, I heard on the CBC that a VIA train hit a car at Brookfield, NS. I passed by there at 15:22 on the TCH. From the highway I could see VIA 15 was stopped past the crossing, and the CN local (headed by an SD40?) was trapped on the cement spur. I understand VIA 6411, the Operation Lifesaver unit, was the leader. Isn't that ironic...don't you think? Fortunately both women in the car survived. My father-in-law sent along a photo of CP 8774 leading a westbound CP train in Chaplin, Saskatchewan. Chaplin is a little hole-in-the-wall town along the Trans-Canada Highway a little west of Moose Jaw. It used to be a division point for the Canadian Pacific but now hosts one industry. It still has a grain elevator but the elevator is used for seeds now. 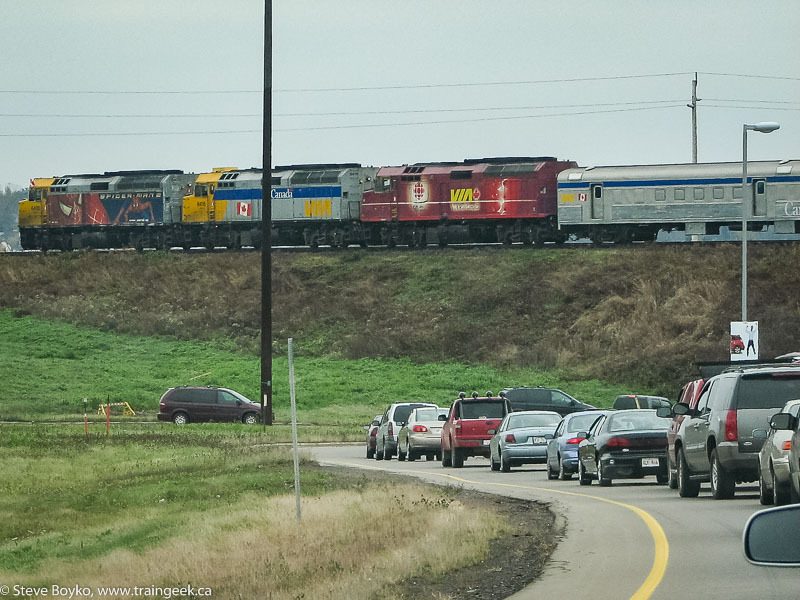 I was in Saint John yesterday afternoon (November 1), and I happened to see a few trains en route. I heard CN 305 on the scanner performing their brake test, and getting their TOP from the RTC before heading out. They were authorized only to mile 44 (Sussex) so I assumed they had some work there or at Penobsquis. Before they left, the Sperry Rail Services truck SRS 870 got off the tracks a little west of the Tim Hortons on Rothesay Avenue. They rumbled by Gerry Drive at 14:38. CN 5606 (SD70I), 2638 (Dash-9), 2533 (Dash-9) and 7068 (GP9) provided the power. The train was pretty long: 56 potash cars, 42 tank cars, 1 boxcar, 8 loaded CN ballast hoppers, 1 tank car, 2 covered hoppers, 10 gypsum cars, 12 container wells, 1 5-pack, 1 well car. The Courtenay Bay potash terminal was totally empty after this! On my way out of Saint John later in the evening, I noticed no activity in NB Southern's Dever Road yard. There was one unit with its light on in the middle of the yard, but no traffic on the scanner. I thought that was odd, because the eastbound should have arrived and they should be making up the westbound to go out later. As I approached Welsford, the reason became clear. NBSR 9801 East was stopped at Welsford with a hot wheel. I pulled into the parking lot of the former gas station, and walked over to the engine in the siding. I tried a few shots with no flash but they didn't turn out, so I turned the flash on and took a few. That drew the attention of the engineer, who came out to talk for a few minutes. He told me the hotbox detector at Welsford was changed out about a week ago and it seems to be more sensitive than the old one. The conductor cut out the brakes on the offending car and they were on their way at 20:00 exactly. NBSR 9801, 2319, 9802 and 2317 provided the power for about 50 cars, a mix of boxcars, empty gypsum cars, autoracks and tank cars. 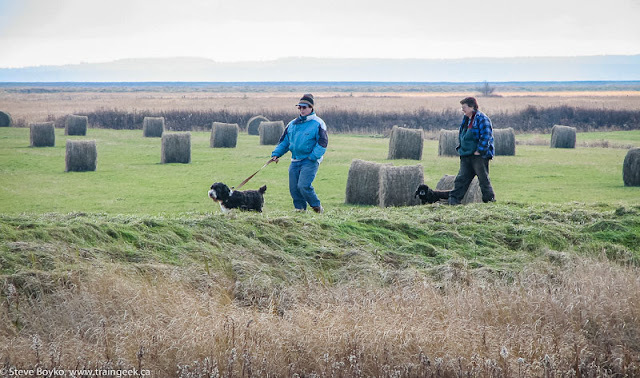 After dropping my son off at bowling, I decided to go to McAdam to see what was going on. When I arrived at 10:45, there was no activity at all. I spent some time wandering around the yard, recording car numbers and taking a few photographs to amuse myself. For example, NB Southern caboose 434919 was there, as well as some NBSR maintenance-of-way (MOW) equipment such as crane 151014, flatcars 301131, 303024, and 421009, and ballast car 455237. Time grew short to pick my son up, so I gave up and headed back to Fredericton. As I descended the hill in Harvey Station at 11:20, I heard a horn blowing for the railway crossing. A westbound NB Southern freight blasted through, led by NBSR 9802, NBSR 3700 and HLCX 3669 and featuring 28 CN gypsum cars (total of 33 cars). I didn't have a chance to grab any good video of the train but I enjoyed the sight nevertheless. Since I was out of time, I couldn't turn around and head back to McAdam. At least I saw something! As a side note, NBSR 3700 ran for another year before succumbing to a major drive shaft failure. It was gutted in late summer 2006 to provide an engine for NBSR 9803. At about the same time, HLCX 3669 left Saint John, presumably returning to Helm Leasing. 3669 had been leased to NB Southern until around the fall of 2005, and it had been idle in NBSR's Dever Road yard until its departure on October 19, 2006.